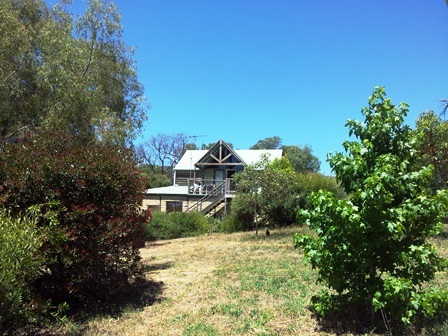 After two years of absence we finally returned to our small farm in Glenburn, Victoria. All of us, the whole family, was exited and nerveous at the same time. What would the place look like? What to expect? Would it look devastated, neglected and run down? Well, it was all rather normal. Our neighbour Victor had cut the grass to make hay and to feed his cows. 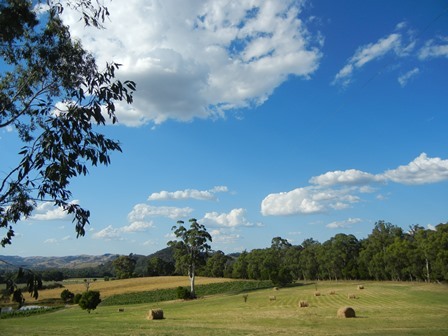 The grass in the paddocks was green and fresh. The vineyard was in good condition as well given the dire circumstances of the mothballing regime. Chardonnay and Pinot Noir looked very good; only the old vines of the Sauvignon Blanc seemed to suffer a bit. It took me two days to clean the cottage. I still have to do the windows. After a round of repairs the water taps were functioning again properly, and the hot water system was ready for action. The Melbourne weather with four seasons in a day, is a stark contrast to what we are used to in the tropics. So far we had sweltering days with hot northerly winds and temperatures in the 40 Celsius. But the nights remained cool. The heat was followed by cool changes and more often than not one needed a sweater and warm clothes. Our two dams are full to the brim, so are our two water tanks. The spring was very wet. The trees around the cottage have benefited from the abundance of water. Especially the young gum trees have grown quite a bit. But also the deciduous trees from Europe are doing well, especially my oaks. The morning walks are a delight. I usually bump into two families of kangaroos. The long grass makes it easy for them to hide. The birds are noisy and plentiful. Water birds splash in the irrigation dam. The creek at the end of the property is running and full of water. The vegetation is lush though some of the beautiful gums trees near the creek have died. After the bush fire of 2009 many of the old trees have not survived but young growth is everywhere. On the wine front I discovered that our old vintages are still drinkable. Two Hills Merlot 2004, 2006 and 2008 are all holding up. The 2006 vintage is rather an “umpf” wine. The 2004 is not as elegant as it was but nonetheless we are enjoying drinking it. The New discovery is the Fratelli vineyard and winery. Their 2012 Riesling is superb. 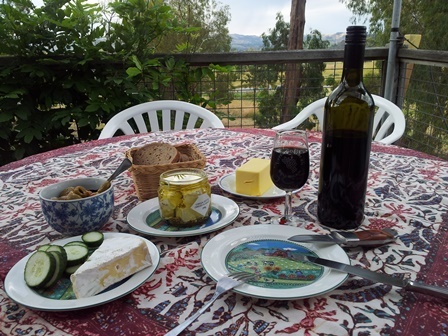 The fruit comes from a vineyard near Mansfield, the old Upper Goulburn wine region. We have more than a month ahead. More bliss on the farm to come. Stay tuned. You are currently browsing the The Man from Mosel River blog archives for December, 2013.